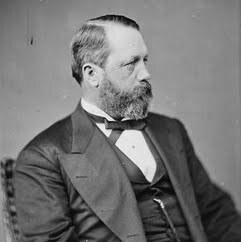 Birthday - Death Anniversary - Amos Clark, Jr.
Amos Clark, Jr. was an American Republican Party politician and businessman who represented New Jersey's 3rd congressional district from 1873 to 1875. Born in Brooklyn, New York, Clark engaged in business in New York City while living in Elizabeth, New Jersey where he was also largely interested in real estate. He was a member of the Elizabeth City Council in 1865 and 1866, served in the New Jersey Senate from 1866 to 1869 and was elected as a Republican to the United States House of Representatives in 1872, serving from 1873 to 1875, being unsuccessful for reelection in 1874. Afterwards, Clark retired to his residence in Norfolk County, Massachusetts, but retained business interests back in Elizabeth. He died in Boston, Massachusetts on October 31, 1912 and was interred in Evergreen Cemetery in Hillside, New Jersey.